The New American Movement was a national socialist organization that sprang from the U.S. "New Left" of the early 1970s. It merged with the Democratic Socialist Organizing Committee in 1982 to form Democratic Socialists of America. The concept of the New American Movement originated soon after the disintegration of Students for a Democratic Society in Chicago in 1969, when ·John Rossen, a one-time district organizer for the Communist Party USA and then the landlord of the SDS offices, distributed a number of pamphlets calling for a new revolutionary force based on a combination of Marxism and American nationalism, and organized the Johnny Appleseed Movement for Peace and Human Rights. "The Meaning of the Bicentennial: Volume One: The Peoples Bicentennial Commission", study, by Max Friedman, ACU Education and Research Institute, 1976, as well as the extensive testimony of Frank Watson and Mary O Walton, in the Senate Internal Security Subcommittee hearings "The Attempt to Steal the Bicentennial: The Peoples Bicentennial Commission", March 17 & 18, 1976. In the late winter of 1970 and into the the spring of 1971, this group worked closely with Rennie Davis in developing plans for the Washington, D.C. Mayday disruptions in support of the Vietnamese communists, with Lerner and Marshall becoming active leaders National Mayday Collective. The Mayday organization provided the New American Community Party with the opportunity to reach a large segment of the radical community and to receive input from New Left theoreticians such as Douglas Dowd and Staughton Lynd. In June 1971, a pamphlet and other materials calling for a NAM national organizing meeting began to be circulated, sponsored by Cook, Lerner and Marshall, plus Douglas Dowd, Karen Hamilton, Charles Fulwood, Joy Marcus, Roger Hamilton, Dan Siegel, Nina Marina, David Danning, Judy Oringer, Louis Feldhammer and Kathy Johnson - the latter on the staff of the People's Bi-centennial Commission. In the early days of NAM, contacts for the organization included Lynne Shatzkin and Jerry Coffin, NY, Michael Lerner, then working from the Cambridge Policy Studies Institute, a branch of the Institute for Policy Studies, Andy Starr, Philadelphia, Alice Lynd and Staughton Lynd, Chicago, Frank Blumer, Seattle, and Jim Williams, by 1975 a co-editor of the Communist Party USA trade union publication, Labor Today. Debate centered on what sort of organization N AM was to be, including its relation to the women's and non-white movements. It was the consensus of the group that N AM would attempt to become a mass organization as opposed to a cadre or sect group. In addition, it was agreed that NAM should focus on organizing working people, broadly defined. We will encourage work in a variety of ways, including community, institutional, and factory work, and will not at this time favor one area. over another. It was also generally agreed that programs, rather than highly developed political lines, would be the distinguishing characteristic of NAM. We recognize the existence of a ruling class which runs America for its own benefit. NAM is committed to democratic socialism, which was defined as a society characterized by economic, racial, and sexual equality; by collective ownership and democratic control of the means of production; by the right to organize independent political parties and independent trade unions, and by the freedom to strike; by freedom of speech, freedom to demonstrate, and freedom of press. We distinguish, a socialist society, defined in this way, from, both welfare capitalism in England and Scandinavia, and from existing societies that call themselves socialist. The transition to socialism will require struggle. Working people will be central to ,that struggle. The liberation of women and non-white groups must be incorporated into every programmatic area. Harry Boyte (Chapel Hil, N.C.). Frank Ackerman, Cambridge, Mass. ; Sally Avery, Durham; N.C.; Edward Bolden, Iowa City; Harry Boyte, Chapel Hill, N.C.; Sandra Kricker and Jim Weinstein, San Franciseo: Roberta Lynch and Judy MacLean,Pittsburgh: Torie Osborn, Mlddlebury, Vt.; Jeff Johnson, Fred Ojile and Shirley Wyatt, Minneapolis: Julia Reichert, Yellow Springs Ohio, Peggy Somers, Berkeley; Melissa Upton, Philadelphia. : and Loren Weinberg, Washington, D.C..
Attendees at the Expanded National Interim Committee of NAM January 2-4, 1976 Pittsburgh, PA . In 1980, a group of Western NAM supporters issued a statement to the National Conference urging closer ties to the Socialist Party USA. Weston also spoke alongside Christine Riddiough, Co-Chair, Socialist Feminist Commission; Kate Ellis, Assoc. NAM, NY DSOC and Cheryl Johnson, Program of African Studies, Northwestern U. in a workshop entitled Feminist Strategies for the '80's. NAM's entry/merger with DSOC was a key mechanismby which Gramscian thought became the mainstream of U.S. Marxism in the 1970s-80s. In essence NAM was the political continuation of the "praxis" wing of the Students for a Democratic Society as opposed to the Weather Underground. 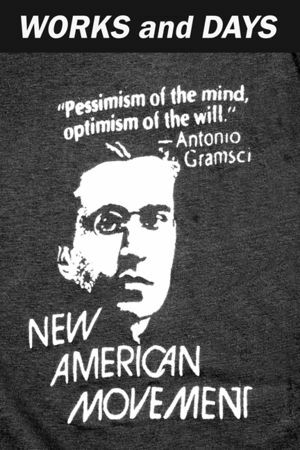 NAM's interest in education also grew out of its members' engagement with the work of Antonio Gramsci. By the mid-1970s, several key figures had taken to heart his analysis of civil society and bourgeois hegemony. In turn, they not only led seminars for NAM members on his revolutionary strategy, but also incorporated his thinking into the organization's program for how to produce a social transformation in what they considered to be a non-revolutionary moment. This interest in Gramsci reflects NAM's approach to Marxism. The reader for its political education course, Basic Marxism: What It Is & How to Use It, clearly demonstrates the movement's critical engagement with this tradition of revolutionary thought. Approximately 380 delegates attended the eighth annual convention of the New American Movementin Milwaukee, August 11-12, 1979. Thanks to an associate membership" program for persons not wishing to be organizationally active within NAM, but who support its program, NAM can claim 875 members in thirty chapters. The most active NAM chapters are in Chicago, Dayton, Pittsburgh, Los Angeles, Detroit and the San Francisco Bay area. The central debate were on what role, if any, NAM should play in electoral politics, particularly in the 1980 presidential campaign and on merger proposals from the Democratic Socialist Organizing Commttee (DSOC) headed by Michael Harrington. Complaints against merger with the 4,000-strong DSOC were many and were led at the convention by the August 7 caucus mainly of ex-members of Trotskyist groups. They charged that DSOC was "social democratic," not "revolutionary socialist" like most of NAM. DSOC was criticised for not taking the side of the Palestine Liberation Organization (PLO), for being "reformist" and insufficiently feminist. NAM chairman Richard Healey and his mother, Dorothy Healey, reminded NAM that merger possibilities have been discussed in the past with the Mass Party of the People, the Socialist Party USA, the International Socialists (IS), and even briefly with the Socialist Workers Party. The result was that NAM agreed to "non-merger talks" with DSOC and the possibility of strengthening DSOC's "left caucus." NAM was strongly opposed to becoming involved in DSOC's backing the Kennedy presidential campaign or draft movement. The Socialist Feminist Commission was a part of the New American Movement in the early 1980s. Its Gay and Lesbian Task Force's newsletter was the Working Papers. Members of the Socialist Feminist Commission and the New American Movement attended the National Socialist Feminist Conference in Yellow Springs, Ohio in July 1975. Anne Hill, Works at Retired!! !